A suicide attack with such a good planning? That in the bombardment of missiles not a single fly has been killed and Taliban facing Allied Forces of 46 countries including America, Britain, France, Germany, Italy and Canada has accepted its responsibility. Those Taliban who cannot be defeated even by fully equipped international armies with latest lethal weapons, destructive attacks and military strategies? Then why did they accept such trash activity? Just for that India can get support to its falling credibility in the area, her presence in Kabul could be given a reason? However there cannot be cruder joke with the world than that. The story of above mentioned jugglery is that on the international level the ambiguity about India’s alleged role in Afghanistan is increasing. In defense analysis and articles the discussion is going on that “when a country has neither border nor cultural link, but it has such interference in the Presidential House that Afghanistan is be thought as dependent state of India”, in America this is being considered that India’s role in Afghanistan should be limited. American analysts have been to say that if India succeeds in spreading her presence in Afghanistan, then in this area it will have drastic effects over American interests. Whole of this situation is also being observed by India. On the other hand Karzai thinks Americans underhand talks with Talibans threat for him. He knew that reality very well that success of talks will make him leave Presidential House. Thus to protect mutual interests of Delhi and Hamid Karzai drama of “Aman Jirga (Peace Jirga)” was staged in Kabul. To address its initial session on Wednesday 2 June Mr. Karzai arrived in the Venue. Where including 300 women 1600 Afghans were present. Media was told about them that they are people influential in provinces of Afghanistan, which can not only take Taliban to peace talks but can also force them for restoring peace. This Jirga was also supported by CIA, which has been using RAW for a long time for its needs. In order to protect venue eight thousand Afghan soldiers were deployed. The important thing of that Jirga was address of Mr. Karzai in which except vilifying Taliban everything else was said. During this at a distance of 100 meters two rockets hit the ground, but Mr. Karzai continued his address. He asked attendants to stay calm and Taliban cannot threaten us with such acts. Meanwhile two powerful bombs blasted, in its result attendants started running for their lives because they were worried for their lives more than Mr. Karzai’s address. Due to their non interest Mr. Karzai left his address incomplete and went back. Media was told about these blasts that two suicide bombers did that. Astonishingly so much happened but except death of suicide bombers no one was hurt. Moreover in history of last years it was first time that media was not allowed to visit that point where suicide bombers have blasted themselves. Probably that is why representative of “Berlin Post” ‘Louis Haas’ declared rocket attacks and blasts as “arranged” and “Jugglery of Delhi and Kabul”. It his news he clarified it that “Delhi and President of Kabul do not want that America leaves Afghanistan or hold talks for restoration of peace with Taliban”. In spite of declaring India responsible for rocket and suicide attacks by Louis Indian media is blaming Pakistan for it. Indian internet websites are full of propaganda and accuses against Pakistan. Although propaganda against Pakistan by Hindu and Jewish media is not a new thing. But the intensity that has been now being was not before. Either they are American weekly ‘Newsweek’ and ‘Time’ or Indian news papers they are struggling to prove Pakistan as heaven of Terrorists. Cooperated style of propaganda is same to driven prey. Definitely enemy is advancing under specific strategy, they are surrounding vex. This advancement can be countered by our intellectuals and media. But they have plenty of time to discuss vainly on politics, however they are not free to counter propaganda against Pakistan. At this front strange silence is prevailing. Where are Aristotles of our free media? Come on! Let me show you a glimpse continous propaganda against Pakistan. In last March weekly Newsweek published a cover story with Title of ‘The Next Alqaeda-?’. Story covering five pages has been read by whomever, he/she has been forced to think that America has done mistake by attacking Afghanistan or Iraq. US should have attacked Pakistan first. Same like scene has been created weekly Time in its May’s publication. First look at the opening of Newsweek’s story. “While the U.S. remains focused on hunting down Al Qaeda's original leadership along the Afghanistan-Pakistan border, a lesser-known Islamic militant group has emerged as potentially the most dangerous terrorist outfit on the planet. For more than 15 years Lashkar-e-Taiba, known widely as LeT, has been targeting Indian interests, particularly in the disputed territory of Kashmir. But Western and Indian intelligence experts say LeT now has a growing interest in attacking foreigners and expanding its reach on a global scale—and that the group has the capability to carry out devastating attacks beyond India.” Copied from Newsweek. Jewish media present in America is trying to credence international media in an unfelt way that in the past active in Occupied Kashmir, Lashkar-e-Taiba has grown more powerful and dangerous than Al-Qaeda. It can spread destruction in America and European countries anytime. And its source and center is in Pakistan. The propaganda campaign against Pakistan is not limited to Western media, in India it is being forwarded after making it harmonious with new needs and ground realities. The image of india’s famous daily newspaper “Siasat” is attached here. 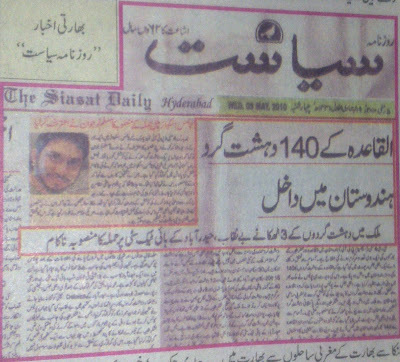 in 5 May 2010’s newspaper in the main heading “entering of 140 Al-Qaeda terrorists in India” news have been published. Further in the news had been written that “a big amount of Al-Qaeda and LET members are active in Assam, according to intelligence report 140 terrorists have entered in India, who are planning to conduct severe acts of terrorism with the help of Pakistani terrorists. These terrorists have entered in India through boats via Srilanka. According to intelligence sources these terrorists have spread in whole India”. Are Indian Nuclear Weapons Safe from Maoist Rebellions? 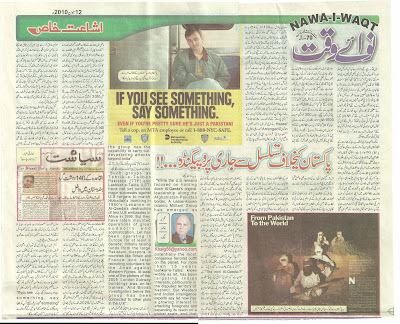 In the end I would like to show my readers an advertisement which is present on different sites of America. All the parts of this Ad are part of a campaign to spread hatred against Pakistan and Pakistanis. Protest against it is duty of all classes of society. In the Ad a Moulvi or student of Madressah has not been shown but an educated young man of Pakistan have been shown. 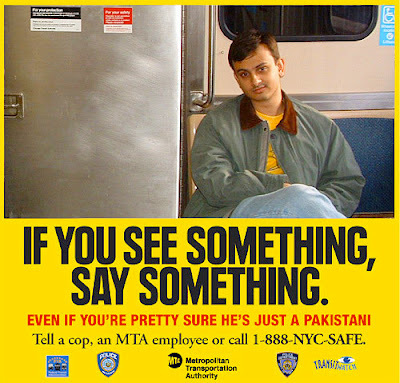 And advice has been made that “If you see something, Say something”. Look at the Ad attentively and you will understand its purpose. But who are our “Media Masters”?